Battlerite. The ‘breath of fresh air’ for the MOBA genre. Mobas have been around since for years now, with humble beginnings as a simple mod for Warcraft III in the form of the first version of DOTA (Defense of the Ancients, if you’re wondering). In most mobas: you farm, you buy some items that never appear on your character, you level up, you farm some more, you get killed, someone afks, you farm some more, and eventually someone wins. There’s a lot of repetition and build-up in these games that can take from fifteen minutes to over an hour, depending on what title you play. 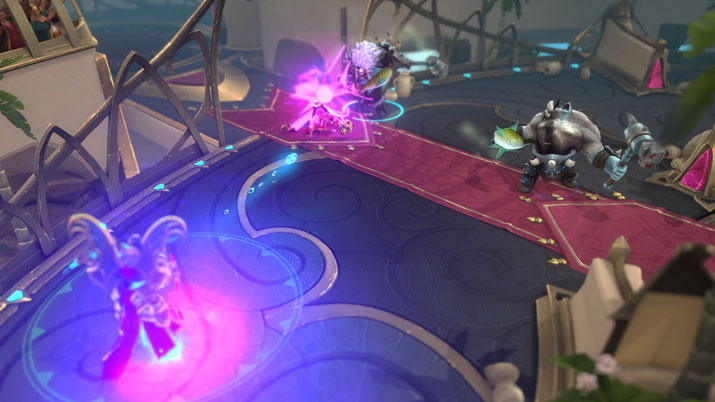 But with Battlerite,you immediately start to fireball, stab, and slash through your opponents in 2v2s, 3v3s or the newly added “Battlegrounds.” Battlerite is a beautifully fast-paced game with many unique heroes, ranging from gunslingers to berserkers, from archers to fire demons, or from shadow demons to nature demons. Each class is complex and differs from the others. The thought and design in the characters and their abilities set this game apart — aside from being one. Big. Team fight. Long set-ups for wombo combos are a thing of the past when you are immediately at your max capability and no longer have to farm minions for the first ten minutes while you wait for you jungler's gank that never comes. Recently Stunlock Studios, the geniuses behind Battlerite released a new... hero? Challenger? Champion? Well, they released Thorn. Thorn is a tanky melee brawler who excels at keeping the opponents on lock down, while keeping his own health up. With half of his kit bringing some form of healing to himself and the other half stunning, rooting, and pulling his enemies in with his root claw, he is an undoubted pain to go against alone. His basic attack — root claw — swings twice before pulling people in and, you guessed it, healing himself. This gives him a pseudo gap-closer with his left click. His right click, Leeching Thorns, launches two short volleys that do a bit of poke damage and damage your enemies over time while giving him a healing over time. Seems like a fair trade right? His space, Burrow, gives him a controlled gap-closer or escape, allowing him to pop up when he wants to stun the enemies. He's a prickly opponent to deal with. His Q is another pull, bringing enemies closer with Evil Clutch, and his E is a long-ranged skill shot root, giving him more CC. His R, Barbed Husk gives him or an ally a shield that makes them immobile, but whenever they take damage the shield bites back, doing 10 AOE damage. His ultimate provides a lot of damage and zoning, but the damage itself is unreliable, as it’s easy to simply walk out of it. On top of his base abilities already bringing a lot to the table, his battlerites, which are like talents, give him more options for healing, shielding, and reducing the damage output of those unfortunate enough to go against this pokey demon. While Thorn is incredibly good at one-on-one combat and staying on top of opponents, he fails to provide any burst damage or really any high DPS. Thus, his fighting style is a little on the slower side, wearing the enemies down with poke, crowd control and self healing. Because all of his abilities have some form of wind-up, you have a window to dodge them, and if you are able to do so, he is left in the open without many defensive options or a counter at the ready (and his longer cooldowns leave him defenseless when dodged).